It's a normal, grey November day here in the Netherlands. For everyone around us, it is a regular, nothing-special day, which is a bit weird. At school there have been no hand-turkeys up on the walls, no paper pilgrim hats, no cornucopias overflowing with veggies - rather, the build up to the arrival of Sinterklaas has been oozing out of every classroom and storefront. Yesterday, there was no madness of the highway or airport on the way to our Thanksgiving destination - since this is the second Thanksgiving that we will not be celebrating with our families. What's even weirder is that I nearly forgot Thanksgiving was happening. I guess without the "regular" visual cues it was a lot easier to have it slip my mind. We will be able to Skype with our families today and share the holiday that way. We may be missing the holiday in America, but we have the opportunity to live abroad and experience so many wonderful things because of our move: learning a new language, experiencing life from a different culture, traveling Europe relatively cheaply, and I could go on. We have made wonderful friends that we could only have met as our paths crossed in the Netherlands. We will still get to celebrate the day, and we will do so with friends, and we will still stuff ourselves silly. We have each other and get to share this crazy expat experience together. And this is just the tip, there are so many other blessings we have on a daily basis. If you're an American in the US or abroad today, I hope you enjoy your Thanksgiving, however and whenever you decide celebrate it. If you're not an American, I hope you enjoy your day anyway, and highly recommend trying out some stuffing and mashed potatoes with gravy - you'll thank me later. 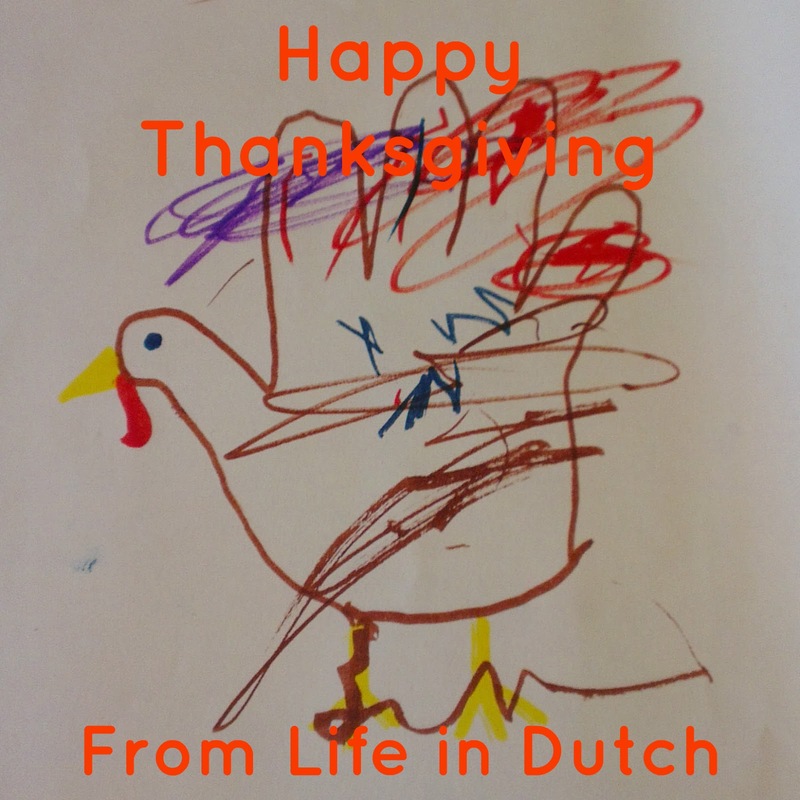 How are you celebrating Thanksgiving, either at home or abroad? Happy Thanksgiving! Once I was on the phone with my mom who works in the school system and I asked her how come she was not at work and calling me instead and she was like ummm Bailie it is a holiday today and I had no idea!! Happy Thanksgiving!!! This is our second Thanksgiving back in the US, but as last year we didn't make the family rounds (and instead had some Brits over to share the holiday) this is our first American Thanksgiving in quite some time. I can't wait! Happy Thanksgiving, Liene! I hope you enjoy the day with family and the delicious trimmings! That's too funny. It really is surprisingly hard to remember when you don't see the "normal" cues. Enjoy your Thanksgiving, Bailie!